Mussels require some effort on behalf of the cook, but they’re relatively inexpensive and well worth the time. Most of the mussels in markets now are farmed (many from Maine) and usually come in 2-pound bags. They’re quite clean compared to wild mussels, but you still need to soak them for 15 minutes with a small handful of oatmeal so they can purge (filter water and expel sand). If the shells seem dirty, use a brush to scrub off barnicles and detritis. Go through each mussel, one by one, discarding any that are broken. If shells are open, give them a gentle tap on the counter. If alive, they will react and attempt to close their shell, and can go in the pot. If they do not react, discard them. You may notice “beards” — hairlike bunches of fibers, which the mussel uses to attach itself to surfaces as it grows. To remove them, grab the beard (a paper towel can help) and firmly tug it out the side of the shell. 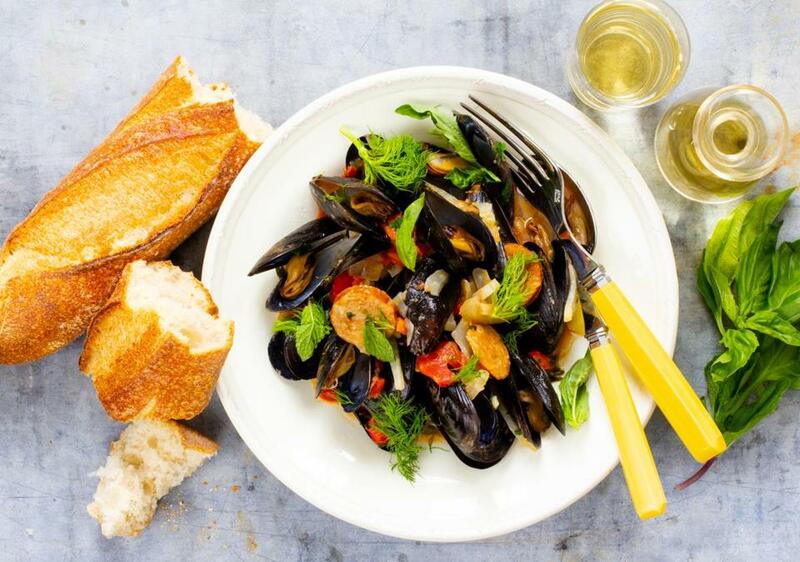 In this dish, mussels cook in a sauce with chorizo, fennel, bell and chile peppers, and lots of basil and mint. In a time of easy foods and the spoils of convenience, sometimes the slightly harder road is better, and the reward, even sweeter. 1. In a soup pot over high heat, heat the oil. Add the onion, fennel, and a generous pinch of salt. Cook, stirring constantly, for 3 minutes. Add the chorizo and continue cooking, stirring often, for 30 seconds. 2. Add the bell pepper. Cook, stirring often, for 3 minutes more. 3. Add the garlic, orange rind and juice, lemon rind and juice, chile, and tomatoes. Cook, stirring often, for 2 minutes. 4. Add parsley, torn basil, torn mint, and wine. Bring to a boil, lower the heat, and cover the pan. Simmer, stirring occasionally, for 10 minutes. 5. Add the mussels and recover the pan. Steam for 3 minutes, stirring gently every minute, or until all the mussels open. 6. Ladle into deep bowls and sprinkle with basil and mint leaves. Serve with baguettes. Lauren Allen can be reached at laurenaallen09@gmail.com.